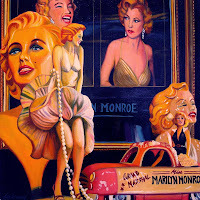 “I listen to the radio a lot, especially the oldies stations," said Lory Lockwood, explaining how Marilyn Monroe and the pop culture of the fifties influenced her most recent work. 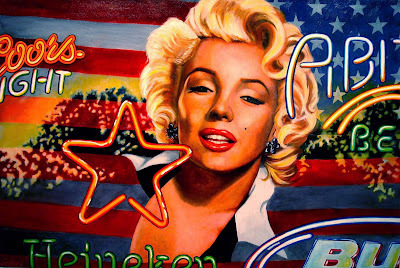 What that really refers to is the American Dream that materialized half a century ago with Marilyn, Elvis and Harley Davidsons, as well as Hollywood movies and muscle cars—the vehicles that inspired so many of Lockwood's canvases over the past decade. 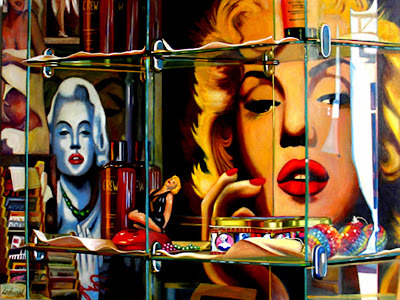 But the glossy, pop-realist paintings in this show depict shop windows where flashily dressed manikins extend the Marilyn era "girly girl" fantasy into the present while reflecting odd bits of the “real world” on the streets outside.